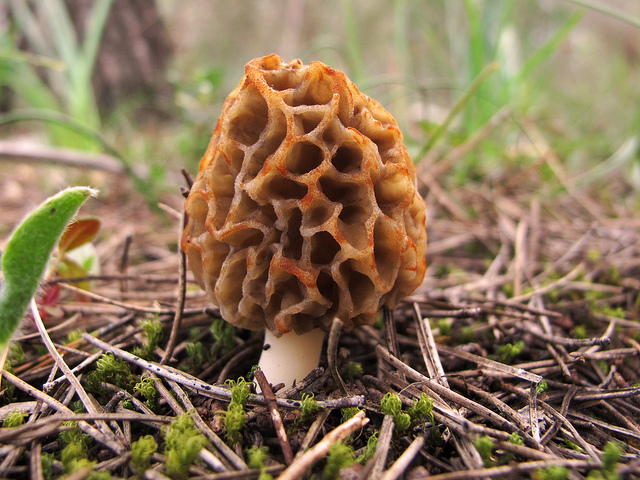 We need to note that there are several varieties of morel, all members of the genus morchella (quick side note: the closely-related genus verpa are not as tasty and have somewhat questionable toxicity). The most common are the esculenta (yellow morel), crassipes (giant morel), deliciosa (white morel), and elata (black morel). All morchella should be eaten cooked- the raw mushrooms often contain a hydrazine compound which needs to be cooked off. This is also true of the soaking liquid, if you use dried morels. Dried and fresh morels have distinctly different flavors and textures. The dried morels are intense and meaty, with a subtly chewy texture. The European dried morels are decidedly smoky. Fresh morels are slightly more soft-rubbery with a subtler, earthy aroma and a wonderful “bite” to their texture. My personal preference is to use fresh morels in very simple preparations and to accompany them with white wine. One of the wonderful things about morels for amateur fungus gatherers is that their appearance is so distinctive; it’s pretty hard to find something toxic that would fool you into thinking it’s a morel. To be certain that you’ve got a morel, just check that the cap is pitted with distinct concave pits. If the cap closely resembles brain-like bulges, it might be a helvella or gyromita, and should be avoided. Dried morels should be soaked in warm water with a tiny pinch of salt until soft. Reserve the soaking liquid for stocks- it should be well-filtered before using and NEVER used without cooking. The morels may need a slight rinsing before using, depending on the dirt level. The French dry their morels with smoke, which gives them a distinctly different flavor than domestic ones. Simplest Prep -This works well with fresh or dried, depending on the wine. Simply sautee the mushrooms in plenty of butter with a little bit of chopped garlic. Cook over a medium-high heat with frequent turns until the mushrooms just begin to give up some juices and wilt very slightly. Stir in a teaspoon or two of chopped Italian parsley. Salt and pepper to taste. This is a wonderful accompaniment to fine old whites; the dish’s simplicity allows the wine’s complexity to stand out. It won’t overwhelm the older wine in the way that strong cheese might. Sauteed fresh morels with a fine old Hermitage blanc is a slice of heaven. This also matches nicely with young, elegant pinots; I love Volnays with fresh morels.